To start with File2Cart fill in a couple of fields or sign in via Facebook or Google. 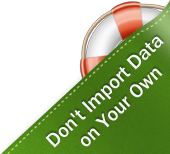 Provide the info required to carry out your import: target cart details, data file or feed. Up to 10 products with all the product info will be imported to your target store. Start Full import or create a schedule of regular imports to your store. Import inventory to your store at once or update it regularly according to your own schedule without any other setups.